The faucets from Carlton series reflect the spirit of the 1920s. This is not only ensured by the porcelain inlay with inscriptions: H for hot and C for cold water and the cross handles, but also the extraordinary design of the faucets itself. Carlton represents an interplay of forms between solid and juvenescent and combines retro design with modern operation. The Carlton product line was designed by Phoenix-Design, who has been working with Axor for over 20 years and can be combined with all 15 Axor brand surfaces. The Carlton washbasin faucets range from single-lever mixers or two-handle mixers with cross handles to three-hole versions, also with cross handles or a lever handle. All have similar characteristic porcelain inlay with lettering for hot and cold water. The separate operating handles on the multi-hole faucets have bell-like appearance to match the nostalgic look of the faucets. Some of the spouts are rotatable or extra tall. The body of the faucet is solid but has discreet spout. In addition to chrome and chrome-gold, the washbasin taps can be manufactured in all 15 colors of the brand Axor. The thermostats for the shower are also distinctive for their nostalgic cross handles. These are either located on the side of the solid, long-stretched thermostat faucets or centrally mounted on a more discreet round rosette. Showers as well as rain showers are also available in the product line of Carlton and make a uniform design of the bathroom possible. For the bathtub, Carlton offers single-lever mixers in elongated shape with light modern look or in a curved shape with a nostalgic look. These have either a lever handle attached on the top or a cross handle attached to the side. 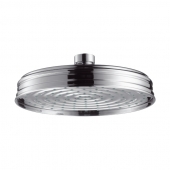 The Carlton line also offers a four-hole mixer tap with cross handles and selectable shower head. Carlton offers a bidet mixer similar to the washbasin faucet. It has a round solid body with slightly curved spout and a ball-and-socket jet former for individual operability. The handle is a forward facing normal lever handle. The faucets of the Carlton can be combined with numerous accessories. These include soap dispensers, paper roll holders and towel holders. 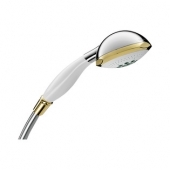 The characteristic chrome-golden color is also available for the faucets and ensures a uniform nostalgic feeling. The range also includes a rotatable and tiltable wall lamp. 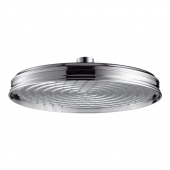 This is fixed to the wall with a metal holder and is also available in all Axor colors.